Lions can weigh well over 600 pounds, but have you ever wondered how good they are at Tug-Of-War? 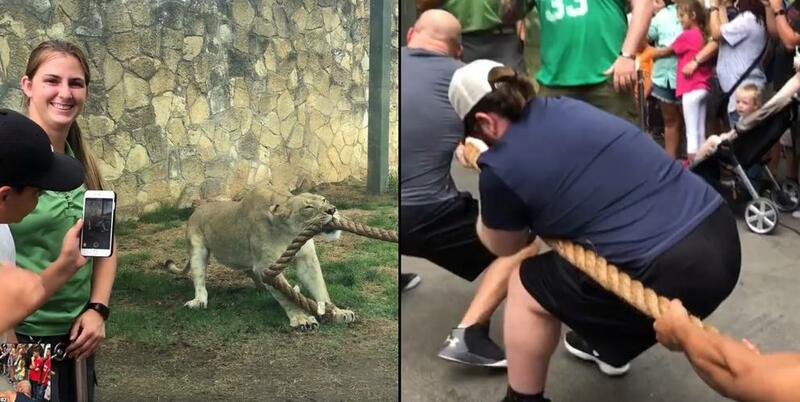 Well, the San Antonio Zoo put a 2.5-year-old lion cub to the test against three full-grown WWE wrestlers from NXT who visited the zoo. The lion turned out to get the better of all three men who couldn't even get the big cat to budge. WWE pro wrestlers Fabian Aichner, Killian Dain, and Ricochet all pulled on a giant rope with only a single lion on the other end. The camera pans from the men giving it their all to the other end of the rope where the lion cub is holding the rope in its jaws and isn't budging an inch. This is a healthy dose of reality that even young animals can outmatch humans and we really aren't as strong as we think we are when tested against natures toughest cats. The lion cub weighs over 300 pounds and gave even the trio of strong men a run for their money. Good thing they didn't place any bets, they would have lost their money!